Barn Finds & Other Myths. Barn finds get a lot of media attention. It is exciting to discover some rare and valuable car hidden in a barn or a forgotten garage. However, when you find the actual car in the barn you discover that animals have been living in it, and mice have been feeding on the wiring. I know of a case where the car in question had been rolled into a barn and covered with hay. The photography was then staged to make it look like a great discovery. Another recently-auctioned "barn find" car was well known to the car clubs and its owner was listed in all the club registers. In other words, the car had never been "lost." Auction houses love to send out dramatic press releases to generate publicity, and the Media, ever hungry for content, accepts the press releases without examining the issuer's motives or verifying whether they are hearing the whole story. 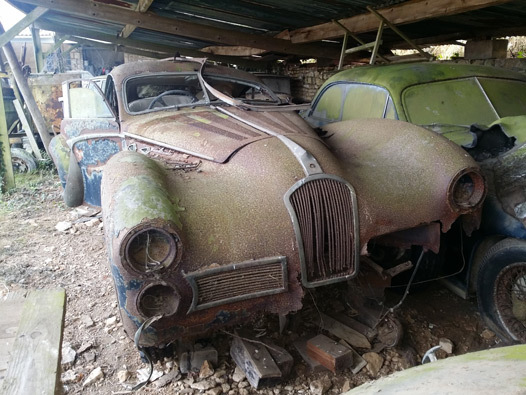 Automotive journalist Willam Jeanes, when asked about barn finds recently, said that he loves to see original cars discovered and preserved, but added that, of course, this is limited by reality. The above two photos are from the Baillon collection auctioned by Artcurial in France in February 2015. 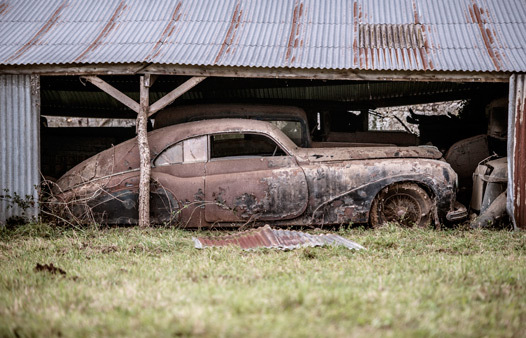 Baillon had bought the cars out of junk yards intending to restore them, but for financial reasons, ended up just storing them in the barn for decades. They are a good illustration of how cars deteriorate in barns. Restoration vs. Preservation. Our goal is straightforward—if I car can be preserved it should be. But many cars are in such poor condition, or have already been partially restored, so preservation may not be not practical. Then it is necessary to restore the car authentically and accurately to its original condition. The right approach depends on the car. Some rare and valuable cars need complete restoration, such as cars that have been seriously damaged or have deteriorated, or where extensive repair or restoration work has been done in the past. Often new body panels or parts need to be fabricated to replace missing originals. When these cars are completed, they look and function as they did when first built. Many of Cooper Technica's Current Projects fall into this category. Other vintage cars have an original condition that is worth preserving because it still looks presentable, or because there is a good historical reason for leaving it original. In these cases, any necessary restoration work must be carried out sensitively so that it does not detract from the original look. With these cars we save as many original parts as possible, even if they have imperfections or show signs of aging. We might need to apply patina to restored parts so that the end product matches the car's overall condition and the restoration work is not made obvious. The 1931 Alfa Romeo 6C1750 GS "Testa Fissa" is an example of this approach. Every vintage car presents unique restoration challenges. Knowing how much and what type of restoration to do at each stage requires both experience and judgment. At Cooper Technica, we help our clients decide which approach and what degree of restoration is best for each project.